Carl Hall, centre, with members of the Doncaster bid team. An emotional Carl Hall feels like he has given something back to Doncaster after the town this week won its bid to stage games at the 2021 Rugby League World Cup. But the New Zealander says the hard work will not stop there. Hall and the team behind Doncaster’s brilliant #backthebid campaign allowed themselves to briefly bask in the glory when it was announced on Tuesday that the Keepmoat Stadium will host three World Cup games. 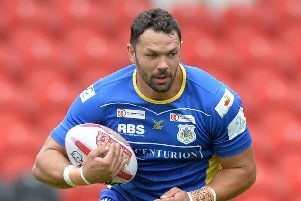 However, the Doncaster RLFC chief executive told the Free Press that Club Doncaster and Doncaster Council officials will soon reconvene to make sure the tournament leaves a lasting legacy. Hall also wants Doncaster to be the first of the 21 confirmed venues, which are predominantly in the north of England, to be putting up the ‘sold-out’ signs. “This club has given me everything and now I feel like I've given something back,” said Hall, who saved the Dons from going out of business ten years ago and stayed on as chief executive following Club Doncaster’s takeover in 2013. “This even supersedes the history we made as a club when we won the play-off final and became champions for the first time in our history [in 2012]. “We have never had a world class event of this magnitude come to Doncaster. “I'm really grateful and humbled. He added: “I would've been absolutely over the moon to get one game. “To get three games has blown me away. “I couldn't read my phone straight after the announcement, I was nearly in tears. “The amount of people saying stuff, it was really quite emotional. When the World Cup was last played in Britain, in 2013, Doncaster’s bid fell short and the town had to make do with a warm-up fixture between New Zealand and the Cook Islands. That led to a more ‘in-your-face’ marketing approach this time, which attracted plenty of attention and praise on social media. “What we learned from the last time was that we really needed to ram it down people's throats. There was no let-up,” said Hall. “We did a big eight-week campaign and the bid team was absolutely outstanding. “From our first meeting we said 'let's stand up and be counted so they can't refuse us'. “The organisers openly said that’s what happened, so the plan we had worked. “I've got to thank Mayor Ros Jones, Jo Miller and their team, Gavin Baldwin of Club Doncaster, and all the partners. The tournament draw will take place on November 27, two years out from the final. In the meantime, in Doncaster, attention will turn to ensuring the event makes the biggest footprint possible. “I think it's a game-changer for the sport in Doncaster,” said Hall. “With any World Cup, whether it's football, rugby or cricket, kids want to play that discipline so hopefully over the next few years we'll see lots of kids in Donny with rugby balls in their hands. “I'm really passionate to help Bentley, Toll Bar and Moorends. “When I first came to Doncaster there was a really strong amateur scene so hopefully we can get more people playing the game. “We want to get out there now and change the culture a little bit. “We're battling against all these gadgets that the kids now have in the house but, with the help of all our partners, we can hopefully get more kids playing rugby league. “The legacy we can leave behind from this is huge. “We had the friendly in 2013 and all those kids are still talking about when New Zealand did the Haka. He added: “Straight away I'm thinking what can we do to fill the stadium? “We'll sit round the table and look at where we go. “My ultimate dream is for every school that we work with to become a nation. “They can learn about the culture, the geography, the dress, the upbringing - everything about that nation. “And then when we roll out the World Cup all these schools come dressed in their nation’s gear. Participating teams in men’s competition: England (hosts), Australia (holders), Fiji, France, Jamaica, Lebanon, New Zealand, Papua New Guinea, Samoa, Tonga, Wales, plus four other European teams (from Greece, Ireland, Italy, Norway, Russia and Scotland) and one other qualifier from Cook Islands, South Africa and USA.